Welcome to the ArduiPi Getting Started guide, if you don’t know what is a ArduiPi board, take a look at the project presentation here. Thank you for using a ArduiPi board, I hope this board will fit all your needs. It has been designed to provide a lot of features, but with so much features, you need to configure the board to enable/disable them. Let start the configuration of the board. As you can see LED are connected “classic” way, this means to lit them you need to set the GPIO or Arduino Port value to 1. Each LED can be driven by 2 ports depending on PLED Pad position. So you need to choose the one you want. ArduiPi board can be used also as an classic Arduino board, this means that you do not need to plug it on a Raspberry PI (even if it as been designed for). For this you can power the board in differents ways. When you use external Power it is not mandatory to plug ArduiPi board on Raspberry Pi, you can use the ArduiPi board as stand alone board. But, you need to tell ArduiPi board that you are using external power. This is done by selecting the on board switch. 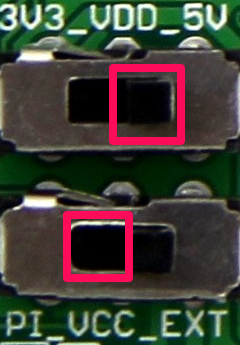 You need to position the switch PI_VCC_EXT (bottom switch of the picture below) to EXT position. The top switch is used to select the value of the power that is provided to the AruiPi board. In the example of above picture, the power is set to 5V. 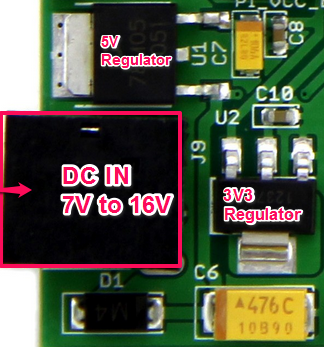 Note that even selecting 5V on the first switch the power applied to NRF24L01 connector is always 3V3, this is to protect the NRF24L01 chip that does not support more than 3.6V. 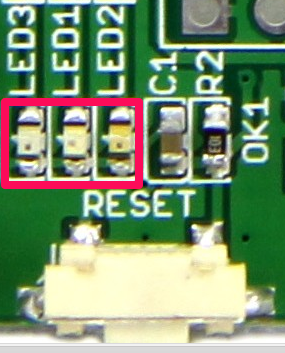 So you don’t need to bother with level translation for NRF24L01 or Breakout board of the same type. Another way to power AdduiPi board is a classic FTDI Cable or FTDI Adapter. But for this to work, you need to solder a jumper (or close directly with a strap wire) on JVDD as follow, and put a jumper on it. 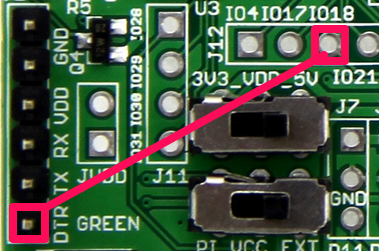 Once jumper in place, as USB cable power is connected to 5V-EXT signal, you need to position the switch PI_VCC_EXT to EXT position like when you power the board with external power. Remember that FTDI usb cable can not provide too much current, so be carefull if you have a lot of devices on ArduiPi board, the power provided by the cable may not be enougth. The FTDI cable need then to be connected on J1 connector of ArduiPi board. You can use any FTDI compatible cable such as this one, this one (shop), or this one. Take care of way of connection (it will not destroy anything if you reverse the connector). Green means DTR signal (connected to Arduino Reset line for Autoreset feature) the two first pins of J1 connector are ground. Take care that as previous case, depending on how much devices are connected to ArduiPi board, the PI power need to be adequate and may not be enought. If not, the Raspberry PI could not even be started. I had this case during the test phase when using grove OLED. So if PI is not starting, choose a good Power for it (1A minimal) and if it does not still work, power the ArduiPi board with external Power. 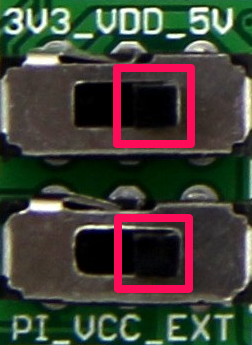 Connect a FDDI cable (from PI USB or another USB computer) to J1 connector of ArduiPi board. For this to work, ArduiPi board should be powered (see how to at previous step above). If you program from another computer, this is the only way to burn sketch on Arduino (except using ICSP but that’s not the deal of the board). This method is fine and quick, but if your IDE is located on your PI you will need one USB port to connect FTDI cable, which took 50% of USB ports of PI (since it has only 2). So the next method could save you one USB port and one FTDI cable. Raspberry PI as a onboard serial port used by the console, you can get this port for you own and to program the Arduino. For this, your Arduino IDE should be on your Pi (or you will need to transfer generated HEX file from external Arduino IDE). 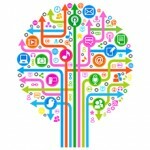 connect RX and TX lines from PI to Arduino. For this you just need to solder wire, or jumper (strongly recommended, see below why) on JTXD and JRXD as follow.. The connector is located on top left of the board. Once this is done, everything is not yet ready. Pay attention doing this, because after it’s done, if you still want to use FTDI cable to program Arduino, you will need to remove the 2 connections (because if not, RX/TX from FTDI will conflict with RX/RX from PI), that is why I strongly suggest to put jumpers on JTXD and JRXD instead of soldering wires, it’s then easier/quicker to put or remove them. /dev/ttyAMA0 is not reconized by Arduino IDE, so we will link it like a real serial device. Connect to your Pi and issue the following command. Now you can use the /dev/ttyS0 as serial into Arduino IDE. But, this method does not Auto-Reset the Arduino to be ready to auto upload Firmware, this means that you will need to use “old school” sync with manual push of reset button from ArduiPi board when uploading sketch from Arduino IDE. But, ArduiPi is a so featured board that you can use a PI GPIO connected to DTR signal to send reset to Arduino. This permit like with a FTDI cable, to compile and upload sketch directly from Raspberry PI Arduino IDE with no manual step. 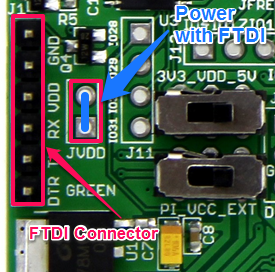 To do this, you need to connect DTR pin of FTDI connector to a GPIO port of Raspberry PI. I choosed GPIO18 but you can change as you want the GPIO port used. The picture above show you what is needeed to enable Auto-Reset Feature. Edit 03/17/2014 : ArduiPi board V1.1 have this connection done by default, no need to wire. 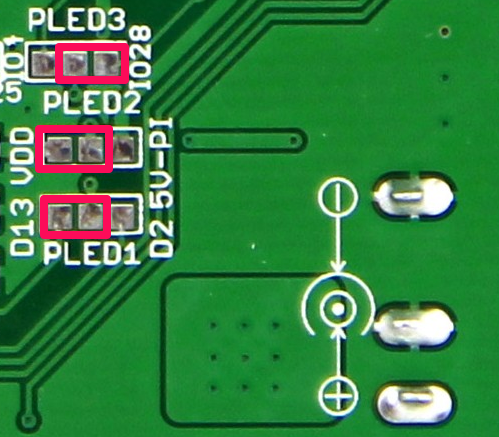 If you want to remove this feature you will need to cut the AUTORST trace PAD on ArduiPi V1.1 board. Doing hardware wiring is not enought, you need to do software patching because the tool used to program the Arduino (avrdude) can’t drive DTR pin of the PI serial port to Reset Arduino but Raspberry PI integrated UART does not have this DTR signal available (this is why we need to use one GPIO pin). So we need to tell the tool that a GPIO is used to drive DTR (reset) signal. For this you need to install Python Raspbery Pi GPIO package and some custom scripts and avrdude if you do not have Arduino IDE installed (issuing a apt-get install avrdude). First we rename original avrdude program to avrdude-original, next install a new python script named avrdude-autoreset and then create a link named avrdude to point on avrdude-autoreset. This new script will launch another script called autoreset which does the reset Arduino and then launch the original avrdude program just after the DTR (reset) line has been pushed low by the GPIO 18. Edit 04/04/2014 : Seems executing the command apt-get install python-rpi.gpio does not install the latest version of rpi.gpio and thus can fire up some warnings when executing autoreset (but still works) so the best solution is using easy_install rpi-gpio . I updated the following procedure to use this command. Most of this stuff about autoreset was grabbed from Internet, I do not remember where but I’d like to thanks the original author of theese scripts which I’ve tweaked. Change the baudrate to the one used by your bootloader, here a specific example card is set to 38400 kbps but in case of ArduiPi board, it should be 115200 (UNO bootloader) instead of 38400.
avrdude-original: reading input file "RFM_PI_Gateway.cpp.hex"
Do not hesitate to look at this script (/usr/bin/reset-arduino) , you can also launch a serial terminal just after the reset (that is what I do every time to check all is fine) if you want to see serial.Print event out from Arduino. This post will be updated soon with more documentation about all ArduiPi features. Drop me a comment if you need to do something that is not yet documented, I will write documentation as soon as you will need it. I’m really missing time on the moment due to a huge optimized project with ArduiLed board.